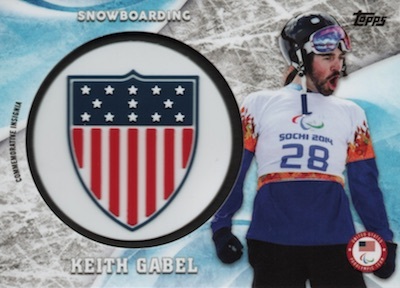 Tap into the excitement of the PyeongChang Olympics with 2018 Topps US Winter Olympics and Paralympic Team Hopefuls! Exclusively covering some of America's best, the hobby-only boxes include one autograph and two relics. 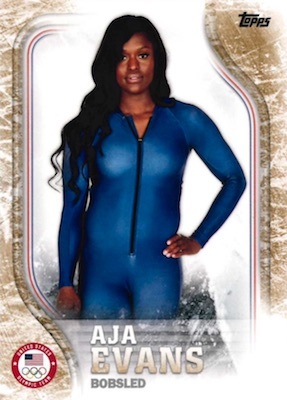 Last seen for the 2016 Summer Games, collectors have a new wave of athletes to obtain, albeit in a much colder setting, as well as a special insert for Olympic skiing legend Lindsey Vonn. 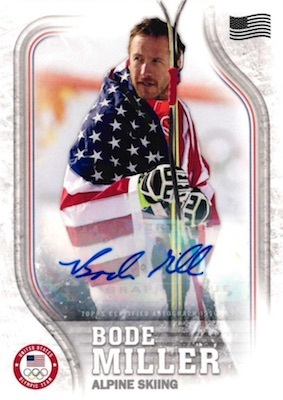 Because the 2018 Topps US Winter Olympics checklist is set in advance, the release applies to many of those who ultimately make the squad, and some of those who aspire to but come up short. 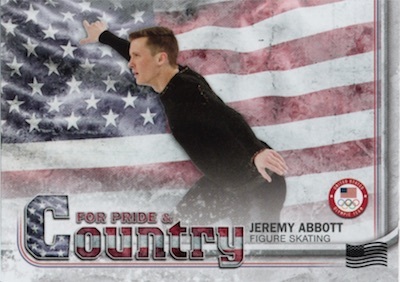 Featuring both the Olympic and Paralympic Team hopefuls, the base set has Bronze parallels at one per pack, plus USA Flag, Gold (#/25), and FoilFractor (1/1) versions. Honoring previous medalists, the Podium Image Variation cards replace the base photo with an image of their crowning moment. Other inserts include Did You Know?, which takes a deeper look at the athletes while adding full-bleed images, and For Pride and Country. 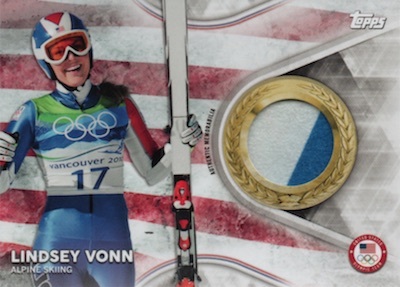 Paying tribute to an Olympic icon, Lindsey Vonn Career Milestones looks back at her career with cards that fall 1:12 packs. There are also numbered USA Flag and Limited Edition (1/1) parallels for each insert except for Did You Know. 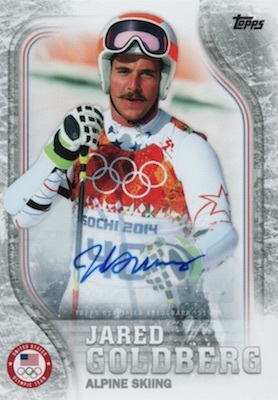 Promising one autograph and two relics per box, 2018 Topps US Winter Olympics Team is simple but effective. The primary Autograph set mirrors the base set in design and with the low-numbered USA Flag (#/25), Gold (#/25), and Limited Edition (1/1) versions. Looking to the past, the Olympic Champions Autograph insert is a case hit with a design sure to evoke some patriotism. These also have Gold (#/25) and Limited Edition (1/1) parallels. 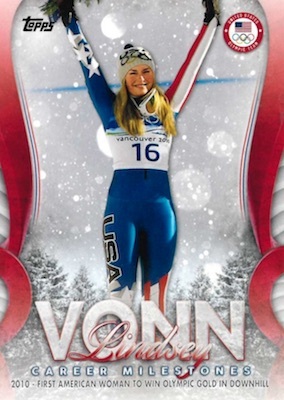 In addition, Vonn is singled out with rare Lindsey Vonn Career Milestones Autographs. 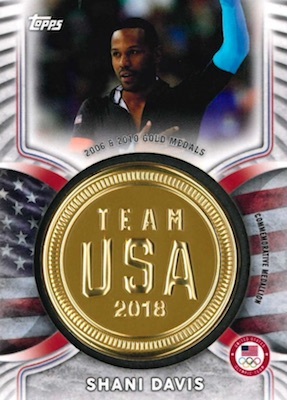 Supplying the final two hits in 2018 Topps US Winter Olympics and Paralympic Team Hopefuls, collectors can find standard memorabilia cards and commemorative relics. The Team USA Memorabilia Pieces set also comes in Silver, Gold (#/25) and Limited Edition (1/1), plus a manufactured Jumbo Wreath parallel. 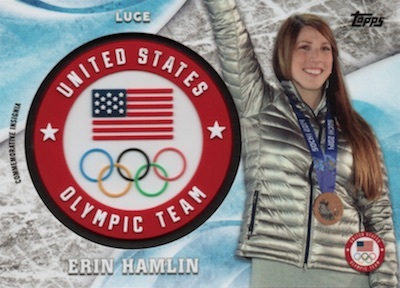 Fully on the manufactured side, numbered USOC Insignia Commemorative Relic cards apply the official logo. These add Silver, USA Flag (#/50) and Gold (#/25) options. Finally, the Achievement Medallion (#/99) set celebrates past performances. RARE 2018 TOPPS OLYMPICS STEVEN NYMAN ALPINE SKIING AUTOGRAPH CARD 60 60 L@@K! 93 cards. Shop complete sets on eBay. PARALLEL CARDS: Bronze (1 per pack), U.S. Flag #/99, Gold #/25, FoilFractor 1/1. PARALLEL CARDS: U.S. Flag #/99, Gold #/25, FoilFractor 1/1. 89 cards. Shop on eBay. PARALLEL CARDS: U.S. Flag #/25, Gold #/25, FoilFractor 1/1. 13 cards. Serial numbered #/99. 1:119 packs. 4 cards. 1:600 packs. Serial numbered #/100 or less. PARALLEL CARDS: Silver Relic #/99, Manufactured Jumbo Wreath #/50, Gold Relic #/25, FoilFractor Prime Relic 1/1. 23 cards. Serial numbered #/99. 1:68 packs. PARALLEL CARDS: Silver #/50, U.S. Flag Emblem #/50, Gold Medal Medallion #/25. 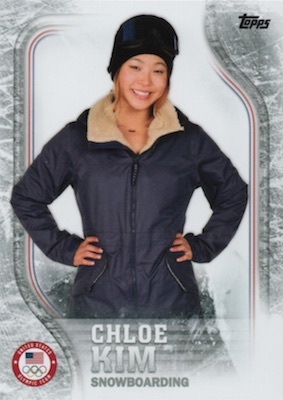 Good: Extra hits in most boxes; Chloe Kim autographs; affordable box price. Bad: More manufactured hits; pretty weak autograph checklist for 2018 stars; designs are bland. 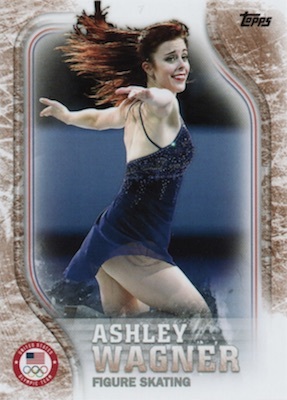 The Bottom Line: The 2018 Topps US Winter Olympics set is a mixed bag, but if collectors want cards for the Pyeongchang Games, this is the only option. 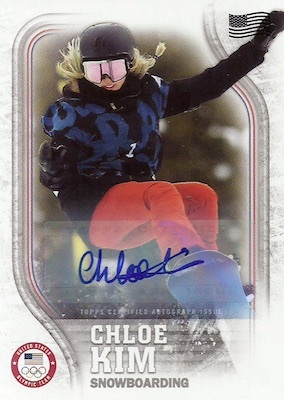 The big signers are not enough to offset the average design and weaker overall checklist, but the bonus hits and chance for Chloe Kim autographs still makes for an exciting break. Like past Olympic card products, this is a bland set when it comes to design. Base cards have a thick frame which results in the look of a generic portrait. Base autographs use this same design but add a sticker signature. 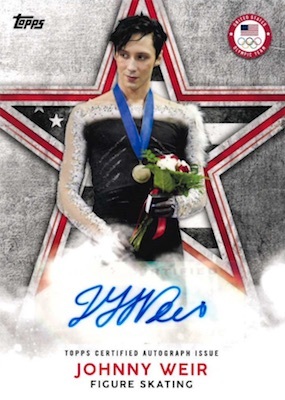 I like the star-background design better in comparison, but this is only in the Olympic Champions autograph set. Inserts are minimal with the mostly full-bleed Did you Know and the flag-filled For Pride & Country. 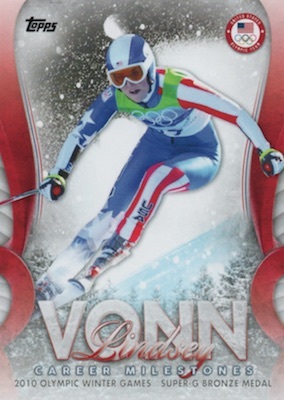 I think the Lindsey Vonn Career Milestones insert is the most fun as it captures the winter feel with snow and trees. Even though they are numbered, the manufactured insignia cards are hard to get excited about. I do feel the commemorative medallions look pretty striking compared to the rubber logos. Also, the memorabilia set does a solid job tapping into the patriotic element with a flag background. 2018 Topps US Winter Olympics has an odd checklist. First, the 93-card base set is actually one small base set that has essentially been doubled. There are new images for each athlete, but still. Why not go deeper into the list of 2018 options rather than adding second cards for many? I understand that Topps was trying to guess who would even qualify but depth would have been better. Again, I realize that it is impossible to predict the future, but the overall autograph set seems pretty light on 2018 stars. Yes, Chloe Kim was a big addition and helps considerably. But beyond that you have Lindsey Vonn, Karen Chen, Nathan Chen, Adam Rippon, Jessie Diggins and not a lot else. Sure, Ashley Wagner and Gracie Gold both could have been big options, but neither competed in 2018. The signature lineup does seem very heavy on figure skaters. And of course Mikaela Shiffrin would have been an obvious autograph candidate, but it didn't work out for whatever reason. Helping the autograph checklist are the past figure skating stars like Brian Boitano, Kristi Yamaguchi and Michelle Kwan. Johnny Weir is especially relevant in 2018 given his role as a commentator. The place where 2018 Topps US Winter Olympics boxes shine most is the value. Each box promises one autograph and two relic cards, but most include more. For example, our review box contained two autographs, two manufactured relics and one memorabilia relic. With boxes in the $60-80 range, that's a decent haul. As the checklist can be a negative aspect, you could still just end up with a lot of low-value hits, but this at least helps soften the blow. Plus, there are big names like Vonn and Kim to chase. The extra hits make this a much more fun product. It might be a case of undersell and overdeliver, but bonus hits feel like a move in the collector's favor for once. And pulling a Lindsey Vonn relic was pretty sweet even though it was not numbered. The cards themselves are underwhelming but the fun is still there. I heard a rumor that Topps was taking away the retail blaster boxes and making these only hobby. Any truth to that? I hope not!! The product was originally solicited as being exclusive to Hobby, so it seems that this means no retail blasters. I’m considering getting a few boxes of 2018 Olympic cards once I figure out if Mikaela Shiffrin has any autograph and memorabilia cards in the set to chase. Anyone know if Shiffrin is in this set? A real Dead product, 2014 Set was 100 cards Base. And had a good mix of Olympic hopefuls & stars .. This set is half the size of 2014 set, and should have been named, The Lindsey Vonn Career Highlights. What happened to Mikaela Shiffrin in this set, she has a better chance to Medal in this Olympic’s. Topps has dropped the Ball big on this Set, Time for New Blood to Create better cards & sets. Checklist is a major letdown. 2 base cards of 45 different athletes, if I’m reading it right. Hobby-only is a major letdown. We don’t all live in big cities with card shops. Absence of Shiffrin and Shaun White is a crime. Some of these people are retired. Very heavy on figure skating. I feel like the person in charge doesn’t watch winter sports. I opened a case. The Good. I like the #’s parallels and the podium variations. The autos are all #d and many have low production #s. There are actually a lot of autograph subjects. The relics are good, though some aren’t #d. The manufactured relics are decent. The bad: As many have stated, the checklist is very limited and filled with former athletes. It is missing some of the young stars. Great value though. I’ll probably buy a box or two, and get a base set together, but I’m disappointed that there are no cards of any hockey players – both from the women’s team AND the men’s. that matched the athletes medal won. Not sure what happened this year. I got a cheap stamped tin mgold colored medal relic and the athlete didnt even win Gold. The medal was crooked on the card to boot. Very poor showing for Topps.